The mask really required a lot of planning and ingenuity to keep it light and secure on my head, while being under the wig so that you couldn’t see the strapping. We went with the inside of a construction helmet (the strappy bits) to keep it held on my head, and balsa wood for the mask and details on the mask. It was actually the most time consuming part of the entire costume. 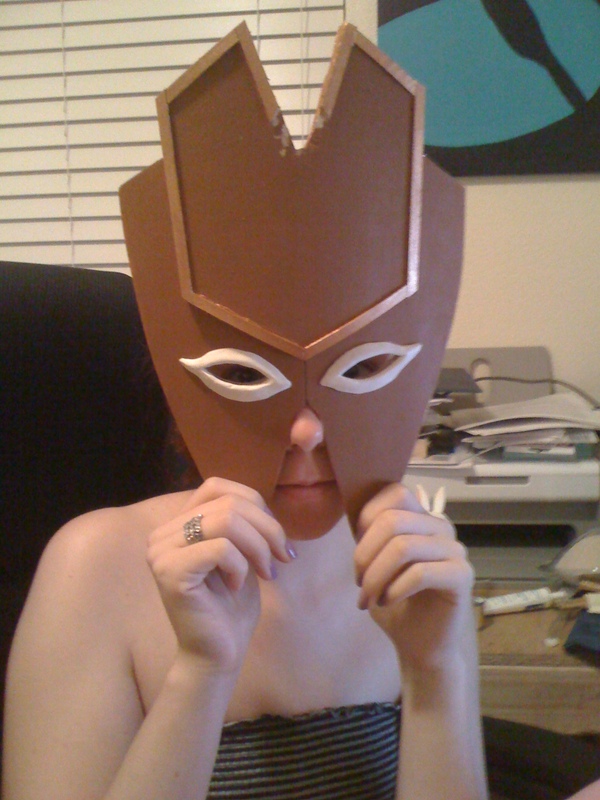 First we measured how wide my face was, and how wide we wanted the mask to be. 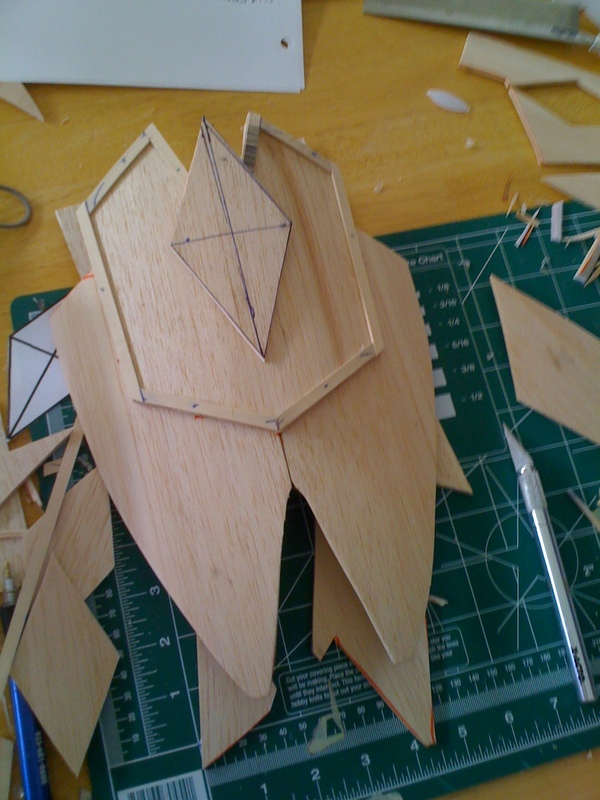 We used a piece of brown packing paper to make a pattern for the general shape, which he then traced on to several pieces of balsa wood and cut out. The bottom piece was in two pieces, only to make it easier to curve, and it was covered anyway, so the seam wasn’t really a problem. 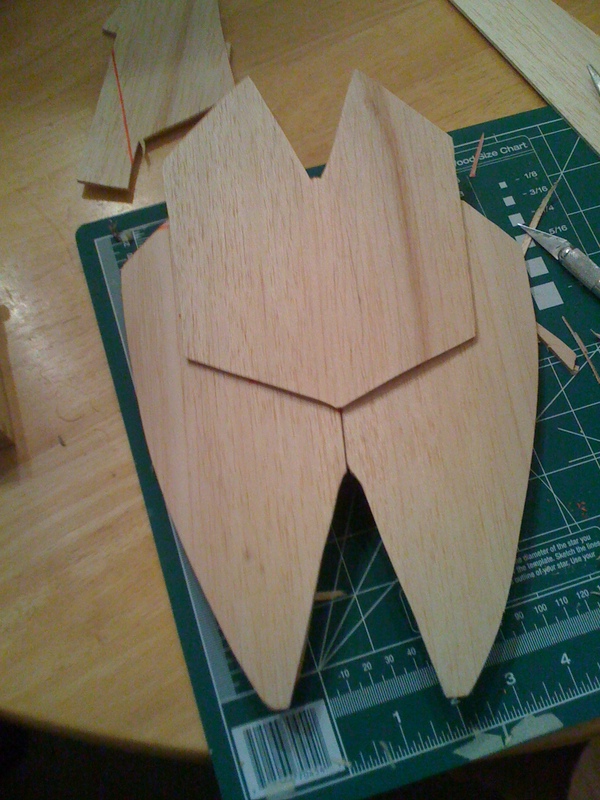 We then made the border for around the mask, and all the details that were raised were also cut out of balsa wood. (I’m missing the other pictures of that progress, sadly.) 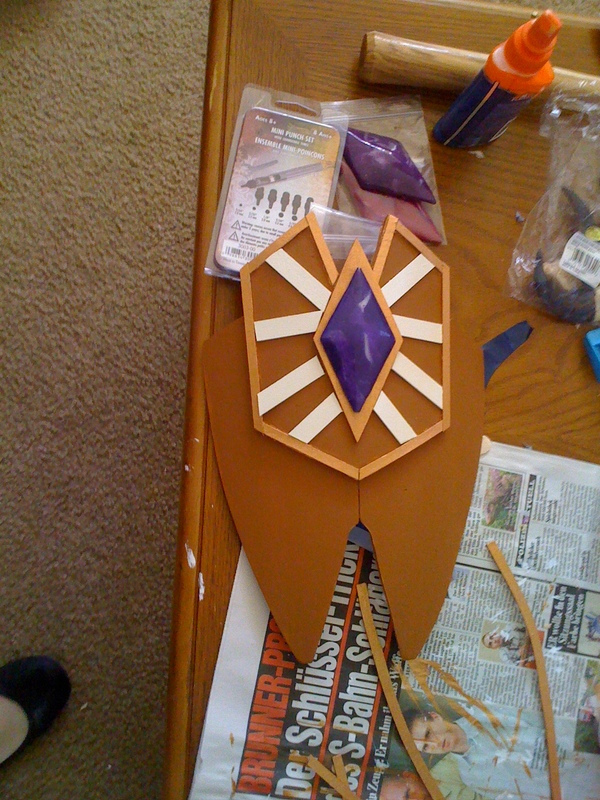 The diamond shape was to figure out the size that we would need to make the gem, since there is a gold border around it. This was before we glued everything on, but as we were painting everything and making sure that everything fit correctly. The gem was made out of Sculpey. Testing the fit on my face. The eye holes were cut out and then the detail around them was done with Sculpey as well. 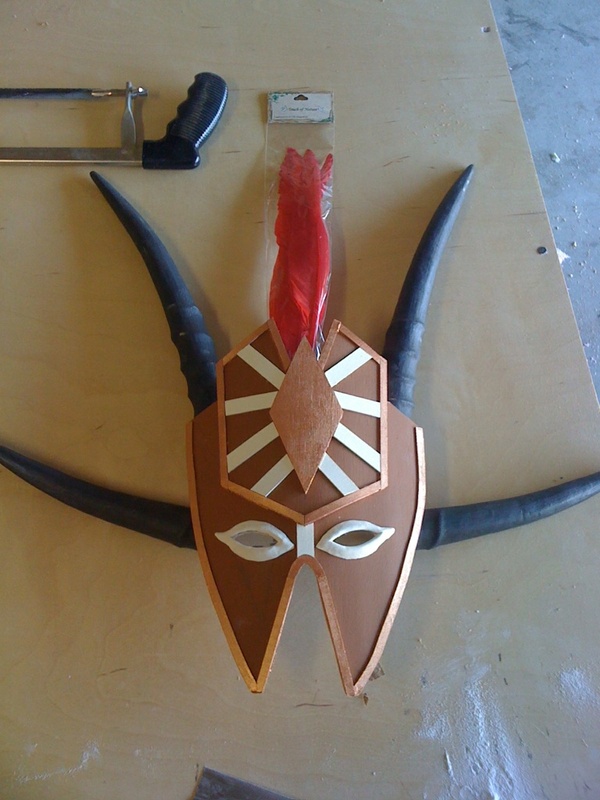 We ordered horns from here (we would have gotten larger, real ones if we could, but it was entirely too much money, and neither of us is good enough at sculpting and keeping it light to go that route) and cut them, then attached them to the back of the mask using two part epoxy. They were amazingly light on my head. The red feather is there to try and decide if they were the right height, since we still had to go out and get the white ones. After wrapping the horns in three different ribbons each, and wrapping the base of the feathers in red string and then hot glueing them to the back of the mask (which was also covered in Wonderflex), we atttached the mask to the head harness using some folded pieces of Wonderflex to hold it away from my face the right distance, and two part epoxy. It held up wonderfully! The only details on the mask that aren’t balsa wood are the triangles under the eyes, and the white marks near the temples. Those were just painted in. I’m very happy with how it turned out! I know that it also looks like there are red feathers all around the mask, but we took some creative license with that and made it the purple spiky hair for the wig instead. If I could change anything, I’d put more padding on the nose and forehead. I ended up having to go back to the hotel room halfway through the day and wrapping my forehead in some fabric so that the mask wouldn’t rub against it and hurt so much. The nose part also was just heavy enough to really hurt when it was pushing down, so I’d add more padding to that as well. Otherwise, I love it! When I wear the costume, I have to put on the mask first, then the wig has to be secured over it. 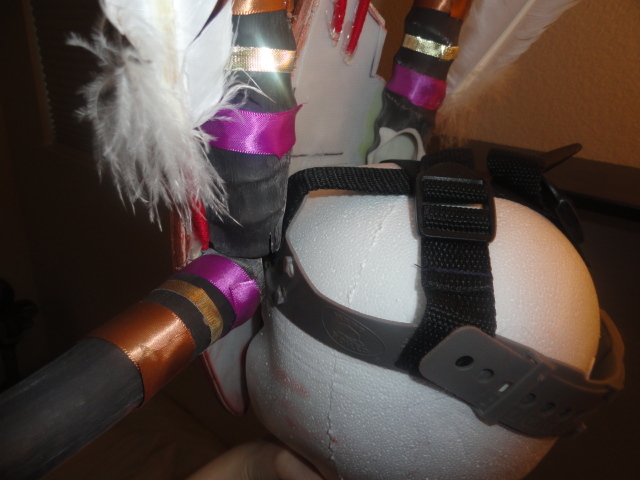 I was afraid I’d have problems with the wig concealing the harness, but it covered it nicely, and stayed on all day. 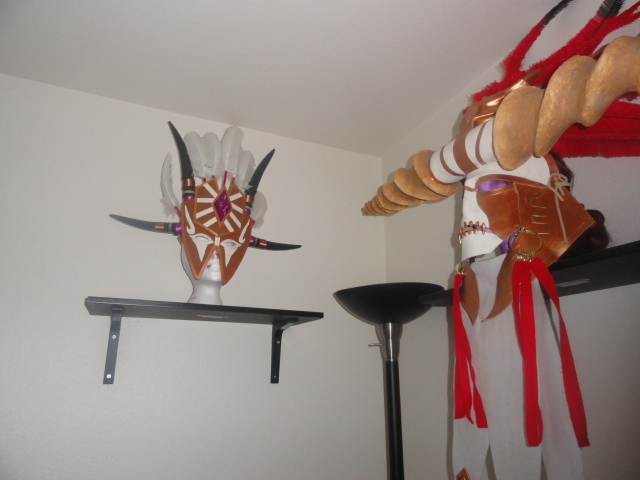 The wigs now have a nice home on shelves in our guest bedroom, along with all of our other large props! 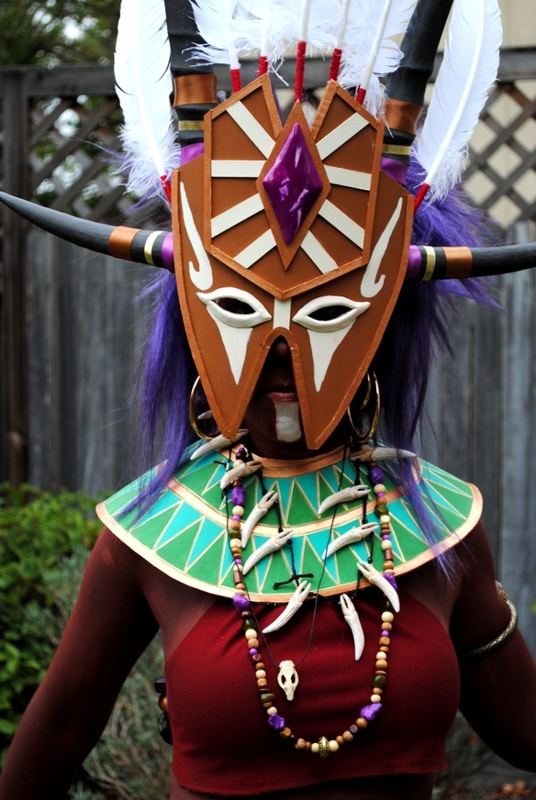 Next post on the female Witch Doctor: accessories and shoes! 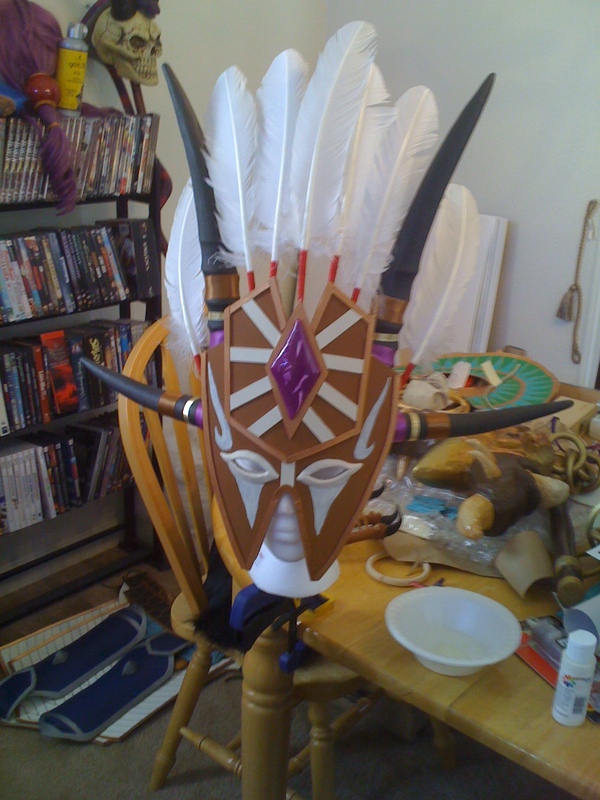 This entry was posted in Female Witch Doctor, Tutorial and tagged cosplay, costume, diablo 3, female, mask, witch doctor. Bookmark the permalink. ← Vote for us in the Otaku House cosplay contest! How did you make/ do the colour of the brown skin? And actually make it last and stay on please!? I used Kryolan body paint, red/brown called 046. I had to call and order the color from them since I couldn’t find it online. It is a red/brown in person and in the container, but in photos it showed up as more brown than red. https://tripleacosplay.com/2011/04/22/male-and-female-witch-doctor-body-paint-also-a-guide-on-body-painting/ is a post that I made about the body painting, with lots of tips!